Two Important Pool Chemistry Test Factors. How to control a pool's pH and Total Alkalinity? Proper chemistry starts with the right water tester. A ColorQ Tester is all-digital and eliminates all the color-matching and guesswork. The topics of pH and total alkalinity are inter-related and are key parameters (factors) in the overall spa water chemistry. pH is the relative acidity or alkalinity of the water. The pH scale goes from 0 (most acidic) to 14 (most alkaline). A pH of 7.0 is neutral. Ideally, spas and hot tubs should be maintained in the 7.2-7.8 range for a variety of considerations: sanitizer effectiveness, bather comfort, corrosion, cloudy water and scaling. Total alkalinity is a measurement of the total quantity of alkaline materials present in the water. Low TA allows for rapid pH fluctuations, makes pH control more difficult and can contribute to corrosion. High TA makes pH adjustments more difficult and can be a contributing factor in cloudy water and scaling. A range of 80-120 PPM is considered optimum. Higher TA readings may not be a problem, so long as the water is clear, there is no sign of scaling or discoloration. The balancing of the overall water chemistry makes for greater bather comfort, helps avoid problems and is necessary to assure optimum spa water quality. If problems arise, refer to the Pool Problems Page, as a source of problem-solving information, broken down into various categories. Scroll down the page and click on the linked keywords, catch phrases or images, in the archived answers below, to access additional information, on that topic or product. ► Low TA - What To Do? 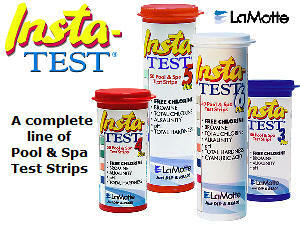 Alan, I just received my LaMotte ColorQ Test Kit, found it very easy to use. But now found out alkalinity very low. Is there a way to get recommendations, on how much chemicals to correct it? Otherwise I’m just guessing and will probably be all over the place! Thanks in advance for your time. TA is a simple calculation. 1.5 pounds of sodium bicarbonate will raise the TA 10 PPM, in 10000 gallons, Example: you need to raise it by 40 PPM and your pool is 18000 gallons - 4 (4, 10 PPM increments) x 1.5 (pounds per 10000 gallons) x 1.8 (size relative to 10000 gallons) = 10.8 pounds of sodium bicarbonate. If you are starting with a low pH, you might need more. Retest and adjust, as needed. Remember, you can always add more - you can't take out. This page should help: Calculating Chemical Additions. The information is objective and is not designed to maximize your chemical usage. 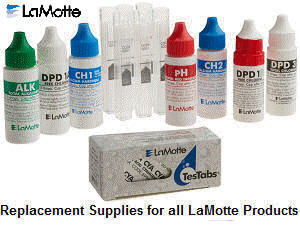 Please visit our website Water Testing Equipment Store to browse through a large selection pool and spa water testers and replacement items, for all LaMotte testers. ► pH On The Rise? I add chlorine manually. I use liquid bleach or shock treatment packages. Usually just 1 lb to maintain chlorine residual. I use 2 lbs when I shock. I am under the understanding that the shock packages have no CYA in it. Since I am already at 50, I do not want to add anymore CYA. Within the last couple of weeks I have been using liquid bleach, since I found it is cheaper than the packaged shock. BTW I do have an ozonator, that helps with the sanitation. Can you use a salt chlorine generator in a freshwater pool? If so, where is the salt coming from? Thanks. You have to add salt to the water, to use a salt chlorine generator: about 25 pounds per 1,000 gallons. Not enough to taste and about 1/15th the level of ocean water. The liquid chlorine and shock both have a high pH and are the reason the pH is on the rise. The same thing happens with a salt chlorine generator, as it produces the equivalent of liquid chlorine. There is no option, so far as adding acid. . A salt chlorine generator works even better, with a solar UV sanitizer, ultraviolet sterilizer or ozonator present. You won't have to produce as much chlorine and that will slow the rise of the pH and help the salt cell last longer. Add a salt chlorine generator and the pool maintenance and sanitation should become much easier and more consistent. Add UV or Ozone and the combination works even better. I hope that this will be helpful. ► Requiring Frequent Additions Of Acid? I have one of the solar salt generators and things are going great, no more yellow algae. I have a 10,000 gallon in-ground pool with an aggregate finish. It is about 18 years old and looks good except for about a dozen black circles where the finish came off. They vary in diameter from the size of a dime to a little larger than a silver dollar. I have to adjust the pH at least weekly and have to add one to two cups per week. I have been told this is excessive. My question is, can the black spots, exposed concrete, be eating up this much acid? I have looked for the cause on the internet and about all I can find is "all pools are different, that may be normal". About 14 years ago I was using powdered shock and the pool store never said anything about adjusting pH. Then the store burned and I went to another local store and started using liquid chlorine. I needed about a cup or more of acid to adjust for a gallon of liquid chlorine. Along the way, it seems I am using more and more acid. It is still cool in Florida and I shock every 3 - 5 weeks. Even on the weeks I do not add chlorine, I still need a cup or two of acid to keep the pH in range. Another thought I had is can I cover up the exposed concrete without draining the pool? I know I may not match the color, but I may be able to make the spots less noticeable. If you think the missing finish is causing my high acid demand, is there a product that can be applied under water? When your were using liquid chlorine, you had to acid on a regular basis. With a salt chlorine generator, you also have to add acid, on a regular basis. How much acid is related to how much chlorine is being produced. No matter how or what you use to chlorinate, the pH has to be monitored and maintain, in the 7.2-7.8 range. Higher pH readings will make the chlorine less effective. So long as the pH is optimized, the additions of acid will not affect the walls or result in corrosion. I doubt that a small area of exposed concrete is the problem. However, you can cover these spots, without draining the pool. Boxer Adhesives offers an underwater epoxy, that cures to a white finish. It would seem like an easy way to repair the finish. I hope that I have provided the solution. ► Battle Of pH and Total Alkalinity (TA)? You sent me an email to look over your revised website. Loved it! Great! I do have a question though, as always!! Even when I have my TA between 80 - 120 my pH constantly increases up to 8.0, this happens daily. I try and gradually decrease the pH by adding acid in a bucket of water each day, but no matter how carefully I do this my TA always drops. I find it much easier, in my pool, to keep the TA low, about 40 - 50. My pH does not bounce around so much and stays at the correct level of between 7.2 - 7.8. My pool often gets a staining problem in summer and my local pool shop tells me its because of the constantly increasing pH levels. I read in your questions page that low TA can cause corrosion, and am now worried. I am interested in your opinions and wonder if I just have an unusual pool. Thanks. Thanks for the reply. It is more important to maintain a pH in the 7.2-7.8 range, than it is to maintain a TA of 80-120 PPM. Your water probably contains some minerals, other than bicarbonates and carbonates, that cause the buffering effect to be higher than normal. Try and keep the pH in range. If you can do this without great difficulty and without daily corrections and, if the water is clear, there is no reason to do battle with the TA. The staining could be due to algae: as the pH rises the chlorine effectiveness decreases and that, in turn, can lead to a greater likelihood of algae growth. From your letter it doesn't seem that you are having pH control problems, so I suggest that you ignore the TA. The staining could, also, be due to dissolved minerals: as the pH rises the solubility of many minerals decreases - another reason to keep the pH in range. Adding a quality, phosphate-free Mineral Treatment, such as Liquid MetalTrap, is always a good idea, if minerals might be present. Alternatively, you could run all new water through a MetalTrap Filter. Nothing is better than preventing metals, from getting into the pool. I hope this is helpful. I don't seem to very good at determining whether the pH color is orangish, orange-red or reddish. It seems the same with strips or liquids. I may have a problem discerning colors, but is there a simple solution? Not everyone is adept at seeing small color differences and certain colors are worse than others. The ColorQ PRO 7 All-Digital, Water Analyzer can easily solve your problem. It performs 7 common tests, pH, free and total chlorine, bromine, total alkalinity, cyanuric acid and calcium hardness. No colors to match and no charts to look up. It is reasonably priced and seems to be just what you're looking for. I hope this will solve the problem. Hi Alan. I have a salt chlorine generator, in a 20,000 gallon aggregate-finished pool. The chlorine is a breeze, but I am always adding acid. Is that normal? What is the best way to handle this? Thank you. Salt chlorine generators are very convenient and certainly do an effective job, as concerns the chlorine level. However, as chlorine is produced, the pH will rise. Therefore, acid has to be added on a regular basis. You might need to add acid, a few times a week, based on chlorine production. Either way, acid has to be added to keep the pH at 7.2-7.8. Unless the pH is controlled, it will keep rising and could cause cloudy water, scaling, loss of sanitizer effectiveness and bather irritation. Adding a solar-powered Pool Mineralizer, will add some backup sanitation and reduce the chlorine requirements. Producing less chlorine will mean that the pH is rise more slowly. In turn, this means less acid or less frequent additions. You can choose the method, but it has to be done. I hope that this information is helpful. ► pH ad TA Reassurance? I have a 22k pool with vinyl liner. It is now clear with a TA of 140 and a pH of 7.0. I have added 2 lbs then another 2 lbs of pH up with little or no change in pH. Any help? pH and TA are interrelated. Raising the pH will raise the TA. In your case the high TA is making pH adjustment difficult. However, once it is in range, it will remain there for longer periods of time. pH is always more important and you need to raise it to at least 7.2. Adjust the pH to 7.2-7.8, as needed. There is no compelling reason to have to lower the TA, once the pH is in range and there is no sign of scaling or cloudy water. If the calcium hardness is over 400 PPM, you might keep the pH closer to 7.2-7.4. There's little point in trying to get both parameters in range, when circumstances and nature are conspiring against you. Good luck. Alan, I did what you said and raised the pH to 7.3. The TA is now 240. My water is clear and looks good the Chlorine is 2.0 Calcium hardness is around 200 ppm. I am scared with the high TA, you are the only person that gives me this advice. My local pool people demand that TA should not be above 120. I suppose I just need some reassurance. Thanks. Nothing like being out there on a limb. And did you notice that I am not trying to sell you chemicals? There is something called the Langelier Index: a predictor of scaling or corrosive tendencies of water. Ideally water should fall within the -0.3 to +0.3 range. Your water calculates out at +0.2. I agree that lowering the TA could be of benefit. However, your water is clear, there is no sign of scaling or cloudy water and Langelier Index is in range and, therefore, there is no compelling reason to lower the TA. High TA tends to keep the pH in place for longer periods of time and, if the pH is optimum, that is a good thing! pH is always more important. Lowering the TA will lower the pH and that opens the door to corrosion and irritation problems. Some might suggest that you add acid to the pool. This will lower the TA, but it will lower the pH, as well. You might end up with a "good" TA, but you will have a low pH. The next step will be to raise the pH. Doing that will raise the TA. In the end, you'll be out money and have water that is substantially the same. You'll feel like a yo-yo. A TA range of 80-120 PPM is accepted as ideal. That means if you are lower, you should raise it into this range. It doesn't necessarily mean, that if you are above this range, you have to lower it, as this depends on other factors. Your TA of 240 PPM is actually lower because you should be subtracting 30% or the cyanuric acid reading form this test value. Ask the dealer, if he guarantees success and that the chemicals will be free, if his instructions are followed and both the pH and TA are not optimized? I suggest that you avoid all use of calcium hypochlorite products, as this will increase the Langelier Index. Right now you are OK, so long as the pH is 7.2-7.5. For shock, use liquid chlorine, non-chlorine shock or lithium hypochlorite. Do not use dichlor products, if you are using trichlor, as this will only speed up the rise of the stabilizer level. You are a good candidate for a salt chlorine generator, which can help you avoid buildup issues and provide more control and better results. I hope that I have helped to make my case. Let me know how things turn out - either way! I just can't get my pH and total alkalinity on the same page. Either both are too high or the pH is too low. It doesn't make sense to add acid and then add soda ash. Have a suggestion? Sometimes, Nature conspires against proper pool chemistry, by having minerals present in the water. pH is always more important and you should get it into the 7.2-7.6 range. If the TA is too high, it might not be a problem, so long as the hardness is not over 400 PPM, the water is clear and there are no signs of scaling. Otherwise, you might try adding acid and dropping the TA to about 100 PPM. Your pH might be too low, at this point. Instead of using soda ash to raise the pH, use sodium tetraborate. It will still raise the pH, but will not contribute to the bicarbonate-carbonate content, which is the basis of the TA test. I hope that this information is helpful. ► pH and Total Alkalinity Challenged? Good morning. I am so confused, I have an above ground pool, 10,000 gallons, pool looked real clear and clean, my pH was low and for some unknown reason to me, I could not get the pH up to par. So I took a water sample to the nearest pool supply store. I was told that my total alkalinity was 250 PPM and the pH was 6.8 and I must get the TA between 125-150 PPM, before trying to balance the pH. I added dry acid and got the TA to 140 PPM. I have now added a total of 5 pounds of pH increaser and it is still low and my pool is cloudy now. What major effect does alkalinity have on the pool and it really necessary to keep it between 125-150 PPM, if the pH and chlorine are balanced? Do you have any idea what is wrong and how I can correct this problem? Is it OK to shock the pool while I am trying to raise the pH? It show I have 1.5 PPM chlorine in the pool, but I have not shocked it for a while and I think that I may need to. Thank you. I'll bet that you are feeling like a yoyo? THERE IS NO COMPELLING REASON TO HAVE TO KEEP THE TA BETWEEN 125-150 PPM, IF THE pH IS CORRECT, THE WATER IS CLEAR AND THERE ARE NO SIGNS OF CALCIUM SCALE FORMATION! Adding the acid lowered the TA and lowered the pH. Adding the pH increaser raised the pH and the TA. You accomplished very little. I suggest that you add pH increaser and raise the pH to 7.2-7.6. If at this point, the water is clear and there are no signs of scale formation, leave the TA alone. The higher TA will help stabilize the pH for even longer periods of time. The only time a high TA will cause a problem is if the calcium hardness level is too high. A calcium hardness level over 400 PPM, might require you to lower the pH to 7.2-7.4. You can add shock at any time. Bear in mind that shock products can affect the pH, depending upon which product is used. I hope that this information will prove helpful. Let me know how it turns out for you. Thank you for your reply to my question. I have now resolved the problem first by several partial drainings, which reduced the alkalinity from the 200 range to just above 100. Then I discovered that I could use sodium tetra borate to raise the pH. This actually does raise pH significantly, BUT has very little effect on alkalinity. Using acid to take both readings way down and then introducing the sodium tetraborate brought the levels to where I wanted them. At least you were not playing yoyo with the pH and TA. The partial drainings lowered the cyanuric acid and, possibly, the hardness level. These contribute directly or indirectly to the TA reading. Unless these parameters were high, you might have accomplished the same effect without the draining. Using sodium tetraborate will raise the pH and not contribute as to the bicarbonate-carbonate alkalinity. To get a truer fix on the TA, subtract 30% of the cyanuric acid reading from the TA reading. I am glad that I have been helpful in solving the problem. ► pH Rising After Cleaning And Refilling? A few weeks ago I emptied, cleaned and refilled the pool. Since then I have problems maintaining a ph between 7.2 and 7.6 . ph increases constantly – when I adjust it to 7.0 with muriatic acid then increases it to 8.0 within one week. And this constantly from week to week TA is 60, ph is ~ 2.5, cyanuric acid is ~ 25. What do I need to do in order not to have to constantly adjust pH? Thank you and best regards. It would have been helpful to know the calcium hardness. I am going to assume that this is a gunite pool. If hat is the case, and the water used to fill the pool was low in calcium hardness, the pH is rising because calcium is leaching from the walls. This will raise the pH, as the walls slowly etch. By raising the calcium hardness to 200-250 PPM, you will stop the etching and the pH should be much easier to control. I hope that this information will be helpful. ► High TA And Green Water? Hi, Alan. We just opened our pool and added fresh city water a few days ago. Our total alkalinity is off the charts – around 400. I keep reading conflicting instructions on how much Muriatic Acid to add and how often. One website said not to add more that 1 Qt per 10,000 gallons in a 24 hour time period. (Our pool is about 16,000). Another website said to add 3 gallons to get it down to the optimal range, but didn’t say how much to add and how often. So far, we’ve added about 1.5 gallons at a slow pace for the last 2 days, but it’s still 400! The pH is registering about 7.0 right now. Also, can we add chlorine? We haven’t added any yet and there is no free chlorine left from the winter. (The pool is green). If it’s OK to add chlorine, should we use shock or liquid chlorine? A TA of 400 is too high. However, a pH of 7.0 is borderline low. You have green water and algae and that is the first step that you need to take. When you solve that problem, you should address the TA and the pH. By all means use liquid chlorine. It will raise the pH slightly and may be all that is needed to correct that parameter. Once the algae is gone, add a dose of a blue clarifier to help remove dead algae and debris. Adjust the pH to 7.2-7.6. If the water is clear and there is no sign of scaling (due to high calcium hardness levels), there is no compelling reason for you to have to reduce the TA. NONE! That is unless you want to add acid, only to have to add pH increaser soon after. It is not always possible to get them both in balance and pH is always more important! My advice on high TA has always been to add one pint of acid daily, until the TA is in range or the pH reaches a low of 7.2 and at that point -- stop! I am not saying that TA is unimportant. A high TA will require more chemicals to adjust the pH. However, if the pH is optimum, a high TA will keep it there for longer periods of time and that is a good thing. If the water is clear, there is no need to keep adding acid and ending up with a low pH and having to boost it up. I suggest that you test the calcium hardness. With a higher TA, you want the level to be not higher than 200 PPM, in order to avoid scaling. If your calcium hardness is above 200 PPM, you might want to lower the TA over time, as I have suggested it be done. I suggest that you refrain from using chlorine or shock containing calcium hypochlorite. I seriously doubt that you have a pH of 7.0 and a TA over 400 PPM. It would be a tall order to create that condition, in a pool. Make sure that the tester is in agreement, with the local pool store. A ColorQ all-digital tester might be something to consider, as it eliminates all the color-matching and guesswork. I hope that you will find the information helpful. ► How Much Acid Is Too Much? When our pool gets out of balance, my husband thinks it must be solved in one day and puts in up to 3/4 gallon acid in one day. My pool repair people think this is excessive. How much acid is too much to be good for people and pool? The important consideration is, what is the pH? Even if I knew how big your pool is, I could not answer the question. If you add acid and end up with a pH below 7.2, the amount was excessive. If the pH ends up at 7.2-7.8, it was a reasonably correct amount. If the pH remains high, more needs to be added. Acid will react with alkaline materials in the pool water and only the pH reading determines, if too much has been added. If your pool is being maintained on liquid chlorine, depending upon how much chlorine is added weekly, a certain amount of acid will probably be required. The amount depends upon your pool size, circumstances and water chemistry. A word of advice. You can always add more - you can't take out! I hope that I have been helpful. ► Worried About Adding Too Much Acid? I've added what I think is too much Muriatic acid in my salt water pool. My test asked for 1 quart for my 20,000 gallon pool and I put 2.5 quarts. Should I be concerned? and do I need to drain my pool? Thank you for your time. Unless your pH has dropped below 7.2, you have not added too much acid. You add acid to lower the pH. If too much is added (the pH is under 7.2), all you need to do is add some soda ash to raise the pH into the 7.2-7.6 range. Salt chlorine generators tend to cause the pH to rise over time, so adding acid will become a regular occurrence, as will the testing of the pH and chlorine. Monitoring the salt test level is important, as it directly affects chlorine production and the life of the salt cell. I hope that I have put your mind at ease. ► Is The High TA Causing Problems? Alan. Nice informative website. I think I've read most of the information you have given regarding high TA and not to worry if the pH is okay and I don't have a problem with cloudiness. However, our water calcium hardness is high to start (city water) and I have noticed shades of grey forming, starting at the bottom of the deep end and a little here and there around the pool. Based on what I have read and been told, scale formation. Depressing, since I'd just had the pool resurfaced last year. My question would be to confirm that I need to lower the TA and if there's anything I can do to get rid of the grey shades. Also lowering the TA will lower the pH, do I simply lower the TA regardless of how low the pH becomes and then raise the pH after? Thanks. The shades of gray could be scale or it could be a mineral problem. Have the calcium hardness level checked. Testing for iron and copper is suggested. If, the calcium hardness is less than 400 PPM, scale formation is either unlikely or easily corrected by lowering the pH and/or the TA. High TA is a problem, if it leads to scale formation. You can do several things: drop the pH into the acid ranges, add a calcium sequestering treatment and slowly restore the pH or add acid and drop the pH to 7.2, add a scale control agent and keep the pH at this low point until the deposits are gone. If your pH should get too low, use sodium tetraborate to raise the pH, as it will do without adding to the biocarbonate0carbonate alkalinity. Your city water may be hard, but it still may not be excessively high in calcium. In either case, I would refrain from all use of calcium hypochlorite products, as it can only add to the problem. The addition of a Magnetic Water Conditioner might help you avoid some of the scaling issues. I hope that this information will prove helpful. ► Low pH and High TA? I know that the pH and alkalinity are generally linked to each other - in that if the TA is high then the pH usually follows. But, I am wondering why sometimes the pH is low and the TA can be high (like a pH 6.8 and a TA at 180 PPM). Have you had any experience on how this phenomenon occurs? And also - the best way to remedy the situation. Thanks very much. When you have a situation as you are describing it is likely because the total alkalinity is not being based solely on the typical bicarbonate-carbonate buffering system. Cyanuric acid and other naturally occurring minerals can produce an alkalinity reading without necessarily stabilizing the pH in the optimum range. pH is always the more important parameter. If the water is clear and there are no signs of scaling, there is no compelling reason to have to maintain a TA in the 80-120 PPM. Adjust the pH to optimum. If the TA is too high (as expected in this case) and the water is clear and there is no scaling present, all that the high TA will do is to help stabilize the pH even more than usual. And that is not a bad thing! Trying to balance both parameters, in every pool, will likely lead to frustration and credibility gaps, in many instances. I hope that I have provided some good advice. Thanks very much, Alan. Working in the profession myself, I can say I both appreciate and respect your knowledge and pool maintenance tips. Good to hear your advice. Best regards. ► Low pH Causes Burning Eyes? We have a "L" shaped pool 40X20X16. The water was crystal clear, steps and skimmers were pure as white. I took a water sample to pool supply place and they said there was no Alkalinity in the water and the pH was very low. Told me to purchase 45lbs of Alkalinity increaser and 10 lbs of pH Increaser. Put to Alkalinity in about 6 hours prior to the pH increaser. Alkalinity went to 155, pH 6.2. They told me to add 5 lbs more or pH increaser. The steps are "BROWN"! and so is the skimmers. And the water is cloudy. As soon an I add a little Muriatic Acid, the steps turn white again instantly! Should I believe the tester of my water or my eyes. It seems to me I should have left the water alone, except when I was vacuuming it a couple of weeks ago, I had an itch in my eye and I think I got a little pool water on my hand then I rubbed my eye. It burned my eye for more than 5 hours after that. I almost went to the Emergency room. What do you think is my problem? Of course you believe your eyes. They're burning because the pH is too low. 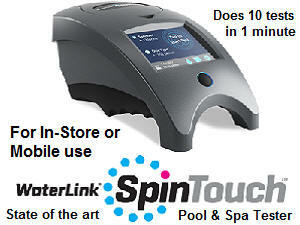 A low pH reading makes the chlorine more irritating and aggressive. It also tends to keep minerals in solution. The brown stains are probably iron and other minerals that precipitated, as the pH was raised. You have no choice about raising the pH. I suggest that you have the water tested for iron. Get the steps white and then add 1-2 doses of a quality, phosphate-free, mineral treatment, such as Liquid METALTRAP, before you attempt to raise the pH. Allow about 6 hours of circulation before attempting to restore the pH. Add pH Increaser only. TA increaser is probably not going to be required. Do not swim with the pH at low levels. Good luck and I hope that I have been helpful. ► What To Do About High TA? Alan, my inground pool is less than 4 months old. Construction is concrete with white marcite plaster finish. I use auto controllers and a UV light system for better water conditions. I have recently run into a problem with pH and alkalinity. This particular pool is 30 x 50 and indoors with a dehumidification system to ensure proper indoor pool climate. When I perform daily/hourly pH and alkalinity tests, the controller is 7.5 pH, my pH water test is 7.5. This is good. However, when I perform the alkalinity test, I get readings that are 50 to 80 points per/million too high. If I add acid to lower the TA, then my pH drops and then end up adding dense soda ash or sodium bicarbonate to increase pH. I use liquid chlorine (sodium hypochlorite) for sanitation, and I know it adds alkalinity. How do I get my pH / TA back in balance? Not one word in your letter about cloudy water. That leads me to believe that your water is clear and there are no other problems with the pool water. That being the case, there is absolutely no reason to have to lower the TA. Adjust the pH to optimum and if the TA is too high, leave it be! Unless you are having cloudy water or calcium scale problems, the higher TA will cause no problems. Lowering it will prove elusive and accomplish little. If in the future, if there are cloudy water conditions or calcium scaling, the problem can be addressed. In the meantime, the higher TA will act to better stabilize the pH. I hope the advice will help. ► Bicarbonate Or Soda Ash? I would like to know the difference between soda ash and sodium bicarbonate? I have been using sodium bicarbonate for raising pH. Do I also need to add soda ash to raise Alkalinity? Rule #1: pH is always more important the TA. Always! You seem to have gotten things backwards. Sodium bicarbonate (baking soda) should only be used to raise the TA, as it has only a slight effect on the pH. Sodium carbonate (soda ash) is only used to raise the pH, as it is much more effective than sodium bicarbonate. Soda ash will also raise the TA, to an extent. If you use soda ash to raise the TA, you will probably end up with much too high a pH. I hope that this information is helpful. ► Too Much Total Alkalinity (TA)? My total alkalinity is usually over 180 PPM. My pH is good and the water looks great. My problem is that every time I try and lower the total alkalinity to below 120 PPM, I end up with a pH that is too low. Raising the pH back up, ends up raising the total alkalinity. I feel as if I'm being yo yo'ed. Any suggestions? It is more important to maintain a proper pH, than it is to maintain a TA of 80-120 PPM. Minerals that may occur naturally, in your water, might be contributing to this phenomenon. There is no compelling reason for you to have to lower the TA: your pH is good and the water is clear. Stop worrying about the TA, unless there are signs of cloudiness, the appearance of calcium scale or other water chemistry problems. Leave the worrying to those with very low TA, that are unable to keep the pH from bouncing. Enjoy the summer. I refilled my spa last week and I just had my water tested and the results follow: pH 7.4, TA 155, calcium hardness 178, bromine 3.5 PPM. The water looks perfect. The dealer suggested that I add some Total Alkalinity Decreaser. Should I add the product? I'm not sure that it's necessary. Please let me know what to do. Thanks. Your TA is marginally above the ideal of 80-120 PPM. However, your pH is ideal. the calcium hardness is very good and the water is "perfect." A higher TA means that your pH will remain in place for even longer periods of time and, with a pH of 7.4, and that is a good thing! In your particular case there is absolutely no reason to adjust the TA. It would be different, if your calcium hardness was too low, or the pH was too high or if the water was not "perfect." I hope that I've made the point. Enjoy the spa. Hello, when I am doing an acid demand test, what product am I adding when it is out of balance? Thanks. An acid demand test is performed, when the pH is too high, in order to determine how much pH reducer (sodium bisulfate) is required. The results are probably in pounds per 10,000 gallons of pool water. Remember, you can always add more - you can't take out! Hope I've been helpful. ► Too Little Total Alkalinity (TA)? Can I use pH increaser to raise my total alkalinity? My readings are around 50 PPM and the pH of the water is 6.9. Needing some help. No, you should not use pH increasers to raise the TA. To do so could raise the pH too high and that will require more adjustment in the opposite direction. Raise the TA, using a Total Alkalinity increaser (sodium bicarbonate) and then test the pH. If too low, add some pH increaser. In all likelihood, adjusting the TA will correct the pH and bring it into the ideal range. Enjoy the season. ► Low TA and Proper pH? Since you are a professional in the field I have to ask you this question. I know there are some questions posted about low total alkalinity and pH. I am an inspector for swimming pools, and know the consequences of high and low alkalinity. The total alkalinity is 40-50 (for the past few months), but perfect pH (7.2) and FAC (>0.5 ppm). In our regulation it states that the total alkalinity must be at least 80 ppm. The operator said he always adds sodium bicarbonate to raise the total alkalinity but it always lowers to the present values. You said it might be do to mineral content. In your professional opinion should he try adjusting the tot alkalinity (which it will always lower) or keep it the way it is. Thanks for any feedback. The pH is at the lower limit. The low TA makes it easier for the pH to fluctuate and that is not desirable. All that should be necessary is for the TA to be raised with sodium bicarbonate. As it is added, the pH will rise slightly. Keep adding the bicarbonate, until the TA reaches 80 or the pH reaches 7.6. At that point stop. The type of chlorine that is being used may account for the lowering of the TA and the pH of 7.2. I hope that I have been helpful. The info on how the alkalinity reading is impacted by the cyanuric acid in the pool was very helpful and as I understand the formula, one should subtract a third of the cyanuric level from the total alkalinity reading. Is this correct? The question I have is about my testing of alkalinity. I followed the instructions and find that my reading is 170. I had had my water tested at my pool supply store and the computer says that my reading is 89 after the cyanuric level is considered. My cyanuric level is 70. This is a bit high however I live in Houston, TX and I understand the heat levels require a higher cyanuric level. Any idea why I get such a high reading when I test? I drop the acid demand in slowly and swirl the water between each drop and wait for the water to chance from blue to clear as I count each drop. My water hardness is 280. Thank you for any advice you can offer. If your cyanuric acid level is 70 PPM, it is quite appropriate for your situation. This would contribute 20-25 PPM to the total alkalinity reading. Your TA reading of 170 PPM and the store's net reading of 89 PPM do not agree. One of them is wrong! If your calcium hardness is 280 PPM, it is likely that the TA is not as low as 79 PPM. All I can suggest is that you verify the test results with another water sample or get a more reliable tester or both. Of all the common tests, cyanuric acid can be the least reproducible. An all-digital ColorQ PRO 7 Water Tester will provide you with reliable results and eliminate the color-matching and guesswork. I hope that I have been helpful. ► Dealer Suggested Maintaining A Lower pH? What a great site, it has already given me a lot of help. Last summer when I took a water sample in to the pool shop I though the pH was fine but I was advised to lower it. All summer they told me to keep the pH a bit lower than the usual 7.2. I never got a full explanation, as to why, but they seemed to say it was because of the extreme heat in the Australian summer. Do you know of any reason why pH should ever be kept slightly below the normal recommenced range. At present I have it is in the normal range and it looks fine. If your TA and/or hardness were high, lowering the pH could help assure that the calcium does not precipitate or cause scaling. Most manufacturers that utilize copper ionization, as part of the sanitizing method, prefer a slightly low pH. However, low pH readings below 7.0 can cause corrosion of the copper in the heater and will make chlorine more irritating, but it will make the chlorine more effective. The high summer temps might have prompted the recommendation. You might ask the dealer, for the reason, as I do not have all the facts, of your situation. I hope that this will prove helpful. If chlorine works better at lower pH readings, why not keep the pH lower than 7.2-7.8? Chlorine does work better at a pH below 7.2. However, there are consequences that will result. Corrosion can present a problem below 7.0. As the pH falls below 7.2, chlorine can become increasingly more aggressive and irritating. The pH of the eye fluid is 7.6 and, as you move further away, discomfort can increase. I hope that I have answered the question. ► Muriatic Acid Or Sulfuric Acid? What are the advantages/disadvantages of muriatic vs. sulfuric acid for pH balance in pools. These pools have salt based chlorination systems. Thanks. Regards. Sulfuric acid has nearly 3 times the pH neutralizing power of muriatic (hydrochloric acid). It lowers the TA, more aggressively, than muriatic acid, but the pH will drop as well. However, it is far more dangerous to handle and, in my opinion, should not be offered for use in swimming pools. So far as the salt chlorination system is concerned, there is no advantage or disadvantage. Did you know that, if you add sulfuric acid to an equal amount of water, the temperature of the solution rises to above the boiling point of water? Stick with the muriatic acid or sodium bisulfate (granular pH reducer), as there is no compelling reason to have to use sulfuric acid. There is a way to make pH control easier, by using an automatic pH Controller. It adds acid, as needed, to maintain the pH within a preset range. I hope that you'll find the advice worth following. Thanks Alan. The reason I am asking is I have installed several acid dispensing systems, using metering pumps, for my neighbors recently. One of them has been using sulfuric acid rather than muriatic. I bought muriatic for him and want to explain the differences to him. Three of us have salt based chlorination systems in my neighborhood and all require constant acid-about two cups per day for a 15,000 gal pool. They also require about 5 pounds of sodium bicarbonate weekly to keep the total alkalinity at about 110. The pools are all over a year old and are made of an aggregate finish, which is common in our area. I wonder if our acid usage will decline, if we forget about total alkalinity and just let that go where it may and just keep the pH at the correct level. Do you have any experience with salt based chlorination systems requiring chemicals like this? We live in Tucson, AZ. Thanks. Alan, your insight is always very helpful. Regards. I directed the question to a leading manufacturer of salt chlorinating systems. The recommendation is to use muriatic acid. Sulfuric acid is not something that is safe to handle. Muriatic acid may not be pleasant, but it is far safer. Good luck and I hope that I have been helpful. ► Dry Acid Or Muriatic Acid? If I were to use a liquid acid (instead of dry acid) to reduce pH, is there a difference between using muriatic and dry acid? I seem to recall reading something that pool dry acid would be less likely to reduce TA as much as muriatic. Is that true? The two chemicals have exactly the same effect on pH and TA, when you allow for differences in their form. Three pounds of the dry acid (sodium bisulfate) has about the same pH lowering and TA lowering strength as one-liter (just over 1-quart) of muriatic acid (hydrochloric acid). The dry acid probably costs more, but is easier to handle, less apt to spill and lacks the noxious fumes of the liquid acid. I hope that this clarifies the issue. ► Using Carbon Dioxide To Lower pH? I’m new to pools, but as purchasing coordinator for a retirement community, I am getting involved. I am told that CO2 can be used as an effective pH reducer. My question is how does CO2 react to cause this drop in pH. Any information you can afford would be greatly appreciated. Carbon dioxide or CO2 dissolves in water forming carbonic acid. It is a weak acid and will lower the pH. It is not simply added to the pool. It will require special feeders and may not be very cost effective or efficient. It's main advantage is probably the safety issue. Most pools of your type rely on muriatic acid for pH reduction, which can be used with a pH Controller or metering system and is very cost effective. In either case, at any given pH the water is indistinguishable. I hope that I have been of assistance. ► Low TA And A Good pH? Recently, I refilled an above ground pool (approx 12000 gallons) after a liner replacement. I had the water tested and was told that everything is OK, except for the total alkalinity, which is a little low at 60. If that is the case, do I have to raise the alkalinity to 100, as suggested. Thank you. It is not etched in stone that you have to raise the Total Alkalinity. However, a better question would be "should you raise the TA" and the answer is YES. The purpose of keeping your TA, around 100 PPM, is to help stabilize the pH and avoid rapid changes in pH, as routine maintenance chemicals are added. Ultimately, the higher TA should make the pool water chemistry easier to maintain. About 6-7 pounds of total alkalinity increaser chemical would be required, to raise your pool from 60 PPM to 100 PPM. I'm a believer in correcting low TA. It's your choice. Have a good season. Dear Alan, I really like your website. I do have a question on test strips and alkalinity. Can something in the water make alkalinity not read on a test strip? I am in the pool business and I have this pool that when I use a test strip to test alkalinity it comes up in the 0-40 category. I know this is inaccurate because I added bicarb to the swimming pool and got a 100 reading with test drops. Any information you can supply me with will be a pleasure. Thank You. It's nothing as mysterious as something in the water. One of the testers is not functioning properly or is being misused. Double check the directions. Based on the fact that you added something to raise the TA, I would suspect that the test strips are not read ing properly. The most likely cause is excessive heat or exposure to moisture (wet fingers) or chemicals. It is bad technique to remove a test strip with wet fingers. Have you tried another package of test strips? The product, based on my own experience is suitably accurate and has good shelf-life. You need to verify the test result, by using different test materials or chemicals. I'm sure that you'll find the culprit. If you would like to consider a step up in water testing, the ColorQ PRO 7 Water Analyzer, would be an ideal solution. It is all digital, requires no color matching, eliminates all guesswork or look up charts. I hope that this information is helpful. ► Salt Chlorinator and High pH? Thanks so much for your web site! We installed a Salt Chlorinator about 1 year into owning an in ground pool (plaster sides). We previously used liquid Chlorine and tablets from an in line tablet dispenser. Now we have a great chlorine reading, but the pH is always high. I was told to add acid in the deep end, to lower the alkalinity, and I did get the alkalinity down to 100 at one time, but then it just bumped back up again. I am adding about 3/4 gal of acid in our 23,000 gal pool per week to keep the ph in balance. This seems like a lot of acid and, frankly, I think the pool was easier to maintain when it was on the in line tablet dispenser. One other thing. The pool company said that the city water could be raising the pH, but I turned off the auto-fill for the last couple of weeks and still have the same problem. What do you think? Is it normal to add this much acid? Is there anything I can do to keep the pH down? Why does the pH go up? Thanks very much. Salt chlorinators can tend to cause the pH to rise, because of the chemical decomposition of the salt. How ever, the plaster walls are probably making a contribution, as well. I suggest that you just add acid, as needed, and keep the pH a bit under 7.8. Don't concern yourself with the TA, just the pH. Other than this, your maintenance will be simple. Before, you had to handle, store and add tablets and liquid chlorine and adjust the pH. Prolonged use of the stabilized chlorine tablets would have quickly boosted the stabilizer level, to a point where a partial water replacement would have been necessary. This is no longer a problem: present or future! And did I mention that there is much less sensation of chlorine being present because the odorous byproducts are destroyed, as water passes through the cell? Salt chlorinators are not completely work-free, but, as I see it, they are a lot better than adding chlorine the old fashioned way. I hope that I have been helpful. ► The pH Color Purple? Sometimes when I run a pH test, I get a purple color that looks like the pH is through the roof. I know that it couldn't have risen that quickly. Is the tester bad or am I doing something wrong? Most likely you are using bromine or have added a sodium bromide product. This means bromine is present in the water and, if the concentration is very high, it could interfere with the pH test. Under these conditions this purple color has nothing to do with the actual pH. To avoid this problem, add a drop of chlorine neutralizer test solution (sodium thiosulfate) to the sample before testing. It will discharge or lower the bromine level. Some pH testers are better able to perform properly, in the presence of bromine. I hope this helps explain the problem. ► Low Total Alkalinity And A Stable pH? About 2 weeks ago, after having changed my water, I added an ozonator and a mineral sanitizer (Silver). Since then my pH has remained rock stable at 7.4 and the water is always crystal clear & without odor. The calcium hardness is approximately 100. Everything seems great except my TA is only 30. You answered a similar question where the TA was high, but I do not know if the response is different if the reading is low. Assuming the pH remains stable & the water is not cloudy, is the low TA a concern? A low TA and a stable pH are almost a contradiction. With a TA of 30 PPM, the pH should be bouncing around, especially in a vinyl pool. In a gunite pool, it would be totally unexpected. A proper pH is always more important. I suggest that you have the water tested for pH, TA and calcium hardness by a dealer and compare it with your own results. A TA reading of 30 PPM is subject to much greater inaccuracies than higher readings. The proof will be in the numbers.